Raypak Ruud M336A 333k BTU Pool and Spa Natural Gas Heater. Raypak Digital Propane Gas Heater. Raypak a Rheem Company. The Raypak Digital gas heater comes with a microprocessor-based control center. This allows you to set your pool or spa temperature precisely at your preferred setting by simply pressing the up or down temperature control button. The digital display provides a constant readout of your pool or spa water temperature. Just set it, and forget it! If only your VCR were this easy to operate. Troubleshooting a Raypak gas heater has never been easier. The Raypak Digital has on-board diagnostic controls that let the user and the service professional know what is going on with the heater at all times. In the unlikely event that a problem develops the digital display easily points out the problem and the probable cause. It’s like having a service technician built into every heater! The new Raypak Digital is compatible with most major pool control and remote systems on the market today. Any two- or three-wire remote can connect to the Raypak Digital and be integrated into the pool control system of your choice. Burner design is a critical component in any gas heater. The stainless steel burner system used in the Raypak Digital is inherently forgiving and extremely robust. The burner is self-adjusting to compensate for gas pressure fluctuations, allowing the heater to always burn clean and safe. The soft-opening gas valve ensures smooth turn-on; no “Hard Light” to worry about. Easily removable burner tray and pilot assembly make service and maintenance a simple task. The Raypak Digital use a spark-to-pilot ignition system. This is the most reliable and robust ignition system available- an industry proven standard for over 20 years. The ceramic fiber combustion chamber keeps your heater running efficiently while ensuring the outside jacket stays cool. By using this space-age material, the heater won’t retain residual heat after it is turned off, allowing it to be installed without the need for excessive clearances. This heater is also certified for installation on a combustible surface. Performance and reliability are enhanced by the “pagoda top, ” designed to keep the Raypak Digital operating even in windy conditions. No need for fans to combat drafting problems. This heater is engineered to draft naturally in outdoor installations with its exclusive low-profile design. It is so thoughtfully and carefully constructed it actually protects itself from the things that tend to stifle ordinary pool and spa heaters. It delivers uninterrupted heating performance regardless of falling leaves, wind, airborne debris, rain, downdrafts, updrafts, sleet, snow, etc. PolyTuf Textured Powder Coating. The Raypak Digital has a polyester-coated, non-corrosive cabinet that is more durable than solventborne- and waterborne-coated metal cabinets. Every piece of sheet metal goes through a 7-stage wash system, making certain the powder paint has a perfect bond. Underneath the tough, yet beautiful finish you will find galvanized metal that offers superior rust prevention for years of durable service. Both water temperature and flow rate inside the heater are controlled to help eliminate condensation, sooting and scale build-up that can shorten the life of a heater. Raypak engineered the Unitherm Governor specifically for pool and spa heater applications, regulating low temperature incoming water to help reduce condensation. The Raypak Digital is equipped with polymer headers and an integral copper fin tube heat exchanger built with stainless steel tube sheets. This ensures rust-free performance, especially important when heating spas. Even the smallest details, such as the studs and nuts, are made out of stainless steel. A heater that will last year after year and can easily be serviced if the need should ever arise. The Raypak Digital is built to last with the highest quality integral copper fin tube available. Copper is well known for its ability to efficiently transfer heat, and is an excellent choice for pool and spa heater heat exchangers, where the water chemistry is properly maintained. Raypak heaters are available with an optional cupro-nickel fin tube heat exchanger for added protection against aggressive water chemistry, which has been known to attack copper heat exchangers and cause premature failure. Cupro-nickel’s major advantage over standard copper is that it’s more tolerant of bad water chemistry and is more resistant to erosion, thanks to a harder surface and a wall that is approximately 50% thicker. When you are unsure of your ability to maintain the pool or spa water chemistry, a cupro-nickel heat exchanger is a cost-effective way to protect against premature failure. Raypak offers an optional power vent feature. Sometimes, equipment rooms or unusual venting configurations require the use of a power vent. Being the heater experts, we have this option for you when the need may arise. The D-2 Power Vent assembly is a Category III mechanical draft venting system that operates under a positive static pressure that prevents excessive condensate production in the vent. All sizes are capable of relieving flue gases up to a maximum of 100 equivalent feet of vent length. All models have a standard 4 diameter exhaust connection. Using the Raypak-supplied adjustable 90° elbow, the flue gases may be discharged in any direction (see D-2 Power Vent manual for details). The D-2 Power Vent is also dual-voltage capable (120/240 volt) and engineered for long life and smooth operation. Amp Draw 120 volt. Amp Draw 240 volt. Designation for a Digital heater using propane gas is “EP”; a Digital heater using natural gas is “EN”. Designation for a Millivolt heater using propane gas is “MP”; a Millivolt heater using natural gas is “MN”. Prefix “P” is for plastic (polymer) headers. Suffix “X” is for cupro-nickel tubing; “C” is for copper tubing. Example: P-M406A-EN-X = Plastic headers, 406 model size, digital, natural gas, cupro-nickel. Reduce input 4% for each 1000 feet above sea level when installed above 2000 feet elevation. Technical Features – All Models. PolyTuf Textured Powder Coating : The Raypak gas heater has a polyester-coated, non-corrosive cabinet that is more durable than solventborne- and waterborne-coated metal cabinets. Underneath the tough, yet beautiful finish you will find galvanized metal that offers superior rust prevention and years of durable service. Wind-Resistant Design : No need for fans to combat drafting problems. This heater is designed to draft naturally in outdoor installations with its exclusive low-profile design. It is so thoughtfully and carefully designed it actually protects itself from the things that tend to stifle ordinary pool and spa heaters. Polymer Headers : Polymer headers prevent rust stains from harming your pool’s surface, giving you years of trouble-free swimming pleasure. All-Copper-Fin-Tube Heat Exchanger : The fin tubes of the heat exchanger are each made from a single piece of extruded copper. This integral-fin design allows maximum heat transfer to be attained and maintained. Cupro-nickel is also available as an optional upgrade. Stainless Steel Tube Sheet : Stainless steel tube sheets are used on all Raypak gas heaters. This allows for a completely nonferrous waterway, leaving your pool truly rust-free. CPVC 2″ Water Connections : Standard with every Raypak is a set of 2″ slip-fit CPVC water connections to make your installation secure and effortless. Condensation Protection : The Unitherm Governor helps reduce condensation from low inlet water temperatures. It automatically regulates the water flow to help keep the water temperature in the heat exchanger above 105°F. Both water temperature and water flow rate are controlled to eliminate condensation, sooting, and scale build-up that can shorten heater life. High Flow Rates : The Raypak gas heater comes with an automatic bypass built into the header. Burner Tray : Every burner tray is built to last, from the stainless steel burners to the aluminized metal used in the heat sensitive areas. Innovative design allows for the easy removal of the tray and burners for servicing. Fire Tile : A ceramic fiber combustion box keeps your heater running efficiently while keeping the outside jacket cool. By using this space-age material the heater won’t retain residual heat after it is turned off, allowing it to be installed without the use of costly metal heat sinks. Fuel-Efficient : Energy-smart Raypak heaters consistently achieve the highest efficiency ratings. They exceed all federal and state standards. Technical Features – Digital Models Only. Microprocessor-Controlled Thermostat : The Raypak Digital gas heater features a microprocessor-based control center. This control allows you to set your pool or spa temperature precisely at your favorite setting just by pressing the up or down temperature control buttons. Self-Diagnostic : On-board diagnostic controls let the user and the service professional know what is going on with the heater at all times. In the event that you would ever have a problem with the heater, the digital display will indicate the source. Remote-Compatible : Compatible with most major pool control and remote systems on the market today. Any two-wire or three-wire remote can connect to the heater and be integrated into the pool control system of your choice. Electronic Ignition : Raypak Digital heaters come standard with intermittent spark ignition pilot safety controls. What this means is that the pilot only comes on when there is a call for heat. This provides an energy-efficient way to control your heater’s gas usage by eliminating the need for a continuous pilot. ISO 9001 : We are proud to be an ISO 9001 registered manufacturing plant. It’s one more reason why Raypak is number one in the heater industry today. End-of-Line Test : Every Raypak gas pool heater is plumbed and test-fired before it is put in the carton. This ensures that your heater will work right out of the box and continue to give you years of trouble-free operation. Quality Check Points : The Raypak assembly process includes six final assembly quality check points that help to ensure that every Raypak gas heater is built correctly, and built to last. CSA-Certified : All of Raypak’s gas pool heaters are CSA-certified and are tested by CSA to the ANSI Z21.56 standard. Tracking numbers will be emailed to you as soon as they are available. Any damages must be reported within 24 hours of receiving the product. Special Notes For International Orders. The item “Raypak Ruud M336A 333k BTU Pool and Spa Natural Gas Heater” is in sale since Friday, February 26, 2016. This item is in the category “Home & Garden\Yard, Garden & Outdoor Living\Pools & Spas\Pool Equipment & Parts\Pool Heaters & Solar Panels”. The seller is “pool-and-spa” and is located in Berea, Ohio. This item can be shipped to United States. Raypak Ruud M336A 333k BTU Cupro Nickel Pool and Spa Natural Gas Heater. Raypak Digital Natural Gas Cupro Nickel Heater. Raypak a Rheem Company. The Raypak Digital gas heater comes with a microprocessor-based control center. This allows you to set your pool or spa temperature precisely at your preferred setting by simply pressing the up or down temperature control button. The digital display provides a constant readout of your pool or spa water temperature. Just set it, and forget it! If only your VCR were this easy to operate. Troubleshooting a Raypak gas heater has never been easier. The Raypak Digital has on-board diagnostic controls that let the user and the service professional know what is going on with the heater at all times. In the unlikely event that a problem develops the digital display easily points out the problem and the probable cause. It’s like having a service technician built into every heater! The new Raypak Digital is compatible with most major pool control and remote systems on the market today. Any two- or three-wire remote can connect to the Raypak Digital and be integrated into the pool control system of your choice. Burner design is a critical component in any gas heater. The stainless steel burner system used in the Raypak Digital is inherently forgiving and extremely robust. The burner is self-adjusting to compensate for gas pressure fluctuations, allowing the heater to always burn clean and safe. The soft-opening gas valve ensures smooth turn-on; no “Hard Light” to worry about. Easily removable burner tray and pilot assembly make service and maintenance a simple task. The Raypak Digital use a spark-to-pilot ignition system. This is the most reliable and robust ignition system available- an industry proven standard for over 20 years. The ceramic fiber combustion chamber keeps your heater running efficiently while ensuring the outside jacket stays cool. By using this space-age material, the heater won’t retain residual heat after it is turned off, allowing it to be installed without the need for excessive clearances. This heater is also certified for installation on a combustible surface. Performance and reliability are enhanced by the “pagoda top, ” designed to keep the Raypak Digital operating even in windy conditions. No need for fans to combat drafting problems. This heater is engineered to draft naturally in outdoor installations with its exclusive low-profile design. It is so thoughtfully and carefully constructed it actually protects itself from the things that tend to stifle ordinary pool and spa heaters. It delivers uninterrupted heating performance regardless of falling leaves, wind, airborne debris, rain, downdrafts, updrafts, sleet, snow, etc. PolyTuf Textured Powder Coating. The Raypak Digital has a polyester-coated, non-corrosive cabinet that is more durable than solventborne- and waterborne-coated metal cabinets. Every piece of sheet metal goes through a 7-stage wash system, making certain the powder paint has a perfect bond. Underneath the tough, yet beautiful finish you will find galvanized metal that offers superior rust prevention for years of durable service. Both water temperature and flow rate inside the heater are controlled to help eliminate condensation, sooting and scale build-up that can shorten the life of a heater. Raypak engineered the Unitherm Governor specifically for pool and spa heater applications, regulating low temperature incoming water to help reduce condensation. The Raypak Digital is equipped with polymer headers and an integral copper fin tube heat exchanger built with stainless steel tube sheets. This ensures rust-free performance, especially important when heating spas. Even the smallest details, such as the studs and nuts, are made out of stainless steel. A heater that will last year after year and can easily be serviced if the need should ever arise. The Raypak Digital is built to last with the highest quality integral copper fin tube available. Copper is well known for its ability to efficiently transfer heat, and is an excellent choice for pool and spa heater heat exchangers, where the water chemistry is properly maintained. Raypak heaters are available with an optional cupro-nickel fin tube heat exchanger for added protection against aggressive water chemistry, which has been known to attack copper heat exchangers and cause premature failure. Cupro-nickel’s major advantage over standard copper is that it’s more tolerant of bad water chemistry and is more resistant to erosion, thanks to a harder surface and a wall that is approximately 50% thicker. When you are unsure of your ability to maintain the pool or spa water chemistry, a cupro-nickel heat exchanger is a cost-effective way to protect against premature failure. Raypak offers an optional power vent feature. Sometimes, equipment rooms or unusual venting configurations require the use of a power vent. Being the heater experts, we have this option for you when the need may arise. The D-2 Power Vent assembly is a Category III mechanical draft venting system that operates under a positive static pressure that prevents excessive condensate production in the vent. All sizes are capable of relieving flue gases up to a maximum of 100 equivalent feet of vent length. All models have a standard 4 diameter exhaust connection. Using the Raypak-supplied adjustable 90° elbow, the flue gases may be discharged in any direction (see D-2 Power Vent manual for details). The D-2 Power Vent is also dual-voltage capable (120/240 volt) and engineered for long life and smooth operation. Amp Draw 120 volt. Amp Draw 240 volt. Designation for a Digital heater using propane gas is “EP”; a Digital heater using natural gas is “EN”. Designation for a Millivolt heater using propane gas is “MP”; a Millivolt heater using natural gas is “MN”. Prefix “P” is for plastic (polymer) headers. Suffix “X” is for cupro-nickel tubing; “C” is for copper tubing. Example: P-M406A-EN-X = Plastic headers, 406 model size, digital, natural gas, cupro-nickel. Reduce input 4% for each 1000 feet above sea level when installed above 2000 feet elevation. Technical Features – All Models. PolyTuf Textured Powder Coating : The Raypak gas heater has a polyester-coated, non-corrosive cabinet that is more durable than solventborne- and waterborne-coated metal cabinets. Underneath the tough, yet beautiful finish you will find galvanized metal that offers superior rust prevention and years of durable service. Wind-Resistant Design : No need for fans to combat drafting problems. This heater is designed to draft naturally in outdoor installations with its exclusive low-profile design. It is so thoughtfully and carefully designed it actually protects itself from the things that tend to stifle ordinary pool and spa heaters. Polymer Headers : Polymer headers prevent rust stains from harming your pool’s surface, giving you years of trouble-free swimming pleasure. All-Copper-Fin-Tube Heat Exchanger : The fin tubes of the heat exchanger are each made from a single piece of extruded copper. This integral-fin design allows maximum heat transfer to be attained and maintained. Cupro-nickel is also available as an optional upgrade. Stainless Steel Tube Sheet : Stainless steel tube sheets are used on all Raypak gas heaters. This allows for a completely nonferrous waterway, leaving your pool truly rust-free. CPVC 2″ Water Connections : Standard with every Raypak is a set of 2″ slip-fit CPVC water connections to make your installation secure and effortless. Condensation Protection : The Unitherm Governor helps reduce condensation from low inlet water temperatures. It automatically regulates the water flow to help keep the water temperature in the heat exchanger above 105°F. Both water temperature and water flow rate are controlled to eliminate condensation, sooting, and scale build-up that can shorten heater life. High Flow Rates : The Raypak gas heater comes with an automatic bypass built into the header. Burner Tray : Every burner tray is built to last, from the stainless steel burners to the aluminized metal used in the heat sensitive areas. Innovative design allows for the easy removal of the tray and burners for servicing. Fire Tile : A ceramic fiber combustion box keeps your heater running efficiently while keeping the outside jacket cool. By using this space-age material the heater won’t retain residual heat after it is turned off, allowing it to be installed without the use of costly metal heat sinks. Fuel-Efficient : Energy-smart Raypak heaters consistently achieve the highest efficiency ratings. They exceed all federal and state standards. Technical Features – Digital Models Only. Microprocessor-Controlled Thermostat : The Raypak Digital gas heater features a microprocessor-based control center. This control allows you to set your pool or spa temperature precisely at your favorite setting just by pressing the up or down temperature control buttons. Self-Diagnostic : On-board diagnostic controls let the user and the service professional know what is going on with the heater at all times. In the event that you would ever have a problem with the heater, the digital display will indicate the source. Remote-Compatible : Compatible with most major pool control and remote systems on the market today. Any two-wire or three-wire remote can connect to the heater and be integrated into the pool control system of your choice. Electronic Ignition : Raypak Digital heaters come standard with intermittent spark ignition pilot safety controls. What this means is that the pilot only comes on when there is a call for heat. This provides an energy-efficient way to control your heater’s gas usage by eliminating the need for a continuous pilot. ISO 9001 : We are proud to be an ISO 9001 registered manufacturing plant. It’s one more reason why Raypak is number one in the heater industry today. End-of-Line Test : Every Raypak gas pool heater is plumbed and test-fired before it is put in the carton. This ensures that your heater will work right out of the box and continue to give you years of trouble-free operation. Quality Check Points : The Raypak assembly process includes six final assembly quality check points that help to ensure that every Raypak gas heater is built correctly, and built to last. CSA-Certified : All of Raypak’s gas pool heaters are CSA-certified and are tested by CSA to the ANSI Z21.56 standard. Tracking numbers will be emailed to you as soon as they are available. Any damages must be reported within 24 hours of receiving the product. Special Notes For International Orders. The item “Raypak Ruud M336A 333k BTU Cupro Nickel Pool and Spa Natural Gas Heater” is in sale since Friday, February 26, 2016. This item is in the category “Home & Garden\Yard, Garden & Outdoor Living\Pools & Spas\Pool Equipment & Parts\Pool Heaters & Solar Panels”. The seller is “pool-and-spa” and is located in Berea, Ohio. This item can be shipped to United States. 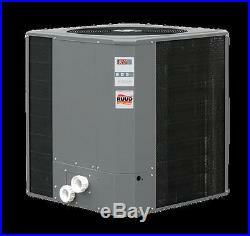 Raypak Ruud 115K Btu Titanium Digital D6350ti-E Heat Pump. Raypak R410A Titanium Heat Pumps. Raypak a Rheem Company. Heat Pumps for your swimming pool. Cost to generate 1 Million Btu of heat. A Raypak heat pump is built with the latest eco-friendly R410A refrigerant that operates more efficiently than R-22. But the most amazing aspect of a heat pump pool heater is its operating efficiency compared to gas heaters. A heat pump operates at 5 to 6 times the efficiency of a standard gas, oil or electric pool heater. If you live in an area where your natural or propane gas costs have out-paced your electricity costs, the savings can be big. Now you can afford to heat your pool more often.. While its true that nothing beats a gas heater for bringing your pool or spa up to temperature rapidly, it can be expensive to operate. Keep in mind that with a gas heater, you also need to run expensive gas lines, or install an unsightly propane storage tank. Raypak units operate quietly, cleanly and most of all efficiently. Installation is no harder than installing a pool pump. Now you can trust your backyard investment to the same people who have been in homes across America for over 75 years. Ask your Raypak heat pump dealer for more details! Raypak pool heater heat pumps are the only heat pumps manufactured by a major air conditioning company. Raypak HVAC product lines have successfully utilized heat pump technology for over 30 years. By taking our field proven technology and combining it with our industry leading pool heating products, we have developed a heat pump pool heater that is second to none. In the unlikely event that you have a service problem, one toll-free call will have your heater up and running again. Raypak heat pumps are truly hassle-free. Extend Your Swim Season in Comfort.. A Raypak heat pump can turn your backyard pool investment into resort style living almost year round. Get the most out of your pool by keeping it comfortable and open longer. Raypak heat pumps give you the flexibility of warming your pool water in the months before and after your normal swim season. Your backyard evening events are rarely slowed down by cool weather when you have a Raypak heat pump on duty. How does a heat pump work? And skip the black magic part.. Raypak air-source heat pump pool heaters work much like a refrigerator in reverse. The heat pump extracts the heat from the warm air, intensifies the heat with a compressor, delivers the heat to the water, and exhausts the cooler air out the top of the unit. Because it uses the warm ambient air temperature to do the work, it is a very efficient way to heat water. One of the biggest misconceptions about a heat pumps operation is what happens to the energy used to run the heat pump. For the most part, this energy does not go into the water. The electricity powering the unit operates the compressor and fan, along with the other controls and electronics. The electrical input energy if converted to btus only amounts to roughly 14,000btu. The bulk of the btu output comes from the heat energy extracted from the air. Thats why they operate so efficiently and the energy savings are so significant. And what does it mean to me, in simple terms? Stands for Co-efficient Of Performance. Its the way efficiency is measured for heat pump pool heaters. Believe it or not, its a very simple calculation. BTU Output ÷ BTU Input = C. See example of the C. Calculation for the Raypak model 5350ti. So based on the calculation above, a Raypak heat pump delivers efficiencies in excess of 600%! The highest efficiency a gas pool heater can obtain is 98%. The mystery is solved. This sounds too good to be true, prove it! We thought you would never ask! Raypak is a proud member of AHRI. Our heat pump pool heaters are third party tested and certified under the AHRI 1160 standard. All performance numbers are listed on the AHRI website directory. The units are tested at a high ambient temperature condition and a low ambient temperature condition. Furthermore, every Raypak unit meets or exceeds the Florida 4.0 minimum C. Requirement and is listed with the California Energy Commission. Unfortunately, not all manufacturers belong to AHRI and their published test data is questionable at best. When shopping for a pool heat pump, look for the AHRI Certified logo. This ensures that you are getting what you pay for, without the smoke and mirrors. Our units are also safety tested and certified by ETL, another third party testing agency. This ensures that all components and electrical design meet or exceed the UL-1995 stand. Old School or New School. We have you covered with the best of both worlds. Our digital control is easy to use, has a pool and spa temperature setting as well as full diagnostics. For those that prefer analog, Raypak offers our direct set thermostat. The easy-to-read, easy-to-use dials allow you to set your water temperature just the way you like it. Gone are the days of the guesswork involved with having to choose between the’blue & red swoosh’ like on your car’s A/Cnow you have the temperature targets displayed right on the dial! Spiral Rifled Titanium Heat Exchanger. And they said it couldn’t be doneTitanium has gained world recognition in just about every industry for its “nearly unbreakable” qualities. Additionally, due to Titanium’s rigidity, it has been nearly impossible to design an ultra-efficient heat exchanger using this metal. Raypak is the first company to offer the Spiral “Rifled” Titanium Tube heat exchanger. This proven technique drastically increases the surface area where super-heated gases can safely transfer heat to water. Rifling a Titanium Tube Heat Exchanger provides a truly efficient waterway that withstands the abuses of harsh pool chemistry and erosion. The spiral “rifled” exchanger also helps reduce deposit buildup, and increases efficiency by performing a scoop-and-lift action. While neither Titanium nor rifling is new to the heat pump industry, leave it to Raypak to bring the best of both worlds together to maximize your backyard investment! Raypak Heat-Cool units extend your swim season even longer! Just the right heat pump for climates that, in addition to having cooler-than-comfortable temperatures, can also have extremely hot summer months. With a Raypak Heat-Cool heat pump, your water temperature will always be comfortable. Just as households around the world have trusted us to heat their water during the colder monthsRaypak will also have you relaxing in your pool during the hot days of summer with cool, refreshing, chilled pool water. Having the ability to pull out the extra degrees Mother Nature put in will make your pool the envy of the neighborhood. No matter what time of year, a Raypak Heat-Cool will have you swimming when others wont venture outside. How Does it Work? Raypak Heat-Cool units have a unique reversing valve which enables the heat pump to not only take the chill out of the water, but also put it back in… Cooling your pool water during the hot summer months! Normally, a heat pump will gather heat energy from the air with its evaporator coil. Using Freon and several other components, the heat is transferred over to your pool water. By reversing this process the heat pump can actually take heat out of the water, transfer it to the Freon, and run it through the evaporator coil. The coil dissipates the heat into the air, much like a cars radiator. This is also the method of defrost for the heat-cool model. In cold ambient conditions, a heat pump will ice-up when the ambient air drops below 45 degrees. With a heatcool unit, the ice will melt off in a matter of minutes when in defrost mode. Standard heat pumps rely on the ambient air being drawn across the coil, which could take hours to defrost the coil, depending on the air temperature. Standard 95,000/92,000 BTU heater. Deluxe 117,000/113,000 BTU heater. Deluxe 133,000/125,000 BTU heater. Excellent choice for pool and spa applications in normal to humid climates. Tracking numbers will be emailed to you as soon as they are available. Any damages must be reported within 24 hours of receiving the product. Special Notes For International Orders. The item “Raypak Ruud 115K Btu Titanium Digital D6350ti-E Heat Pump” is in sale since Friday, February 26, 2016. This item is in the category “Home & Garden\Yard, Garden & Outdoor Living\Pools & Spas\Pool Equipment & Parts\Pool Heaters & Solar Panels”. The seller is “pool-and-spa” and is located in Berea, Ohio. This item can be shipped to United States. Raypak Ruud 130K Btu Titanium Digital D8350ti-E Heat Pump. Raypak R410A Titanium Heat Pumps. Raypak a Rheem Company. Heat Pumps for your swimming pool. Cost to generate 1 Million Btu of heat. A Raypak heat pump is built with the latest eco-friendly R410A refrigerant that operates more efficiently than R-22. 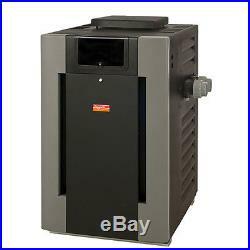 But the most amazing aspect of a heat pump pool heater is its operating efficiency compared to gas heaters. A heat pump operates at 5 to 6 times the efficiency of a standard gas, oil or electric pool heater. If you live in an area where your natural or propane gas costs have out-paced your electricity costs, the savings can be big. Now you can afford to heat your pool more often.. While its true that nothing beats a gas heater for bringing your pool or spa up to temperature rapidly, it can be expensive to operate. Keep in mind that with a gas heater, you also need to run expensive gas lines, or install an unsightly propane storage tank. Raypak units operate quietly, cleanly and most of all efficiently. Installation is no harder than installing a pool pump. Now you can trust your backyard investment to the same people who have been in homes across America for over 75 years. Ask your Raypak heat pump dealer for more details! Raypak pool heater heat pumps are the only heat pumps manufactured by a major air conditioning company. Raypak HVAC product lines have successfully utilized heat pump technology for over 30 years. By taking our field proven technology and combining it with our industry leading pool heating products, we have developed a heat pump pool heater that is second to none. In the unlikely event that you have a service problem, one toll-free call will have your heater up and running again. Raypak heat pumps are truly hassle-free. Extend Your Swim Season in Comfort.. A Raypak heat pump can turn your backyard pool investment into resort style living almost year round. Get the most out of your pool by keeping it comfortable and open longer. Raypak heat pumps give you the flexibility of warming your pool water in the months before and after your normal swim season. Your backyard evening events are rarely slowed down by cool weather when you have a Raypak heat pump on duty. How does a heat pump work? And skip the black magic part.. Raypak air-source heat pump pool heaters work much like a refrigerator in reverse. The heat pump extracts the heat from the warm air, intensifies the heat with a compressor, delivers the heat to the water, and exhausts the cooler air out the top of the unit. Because it uses the warm ambient air temperature to do the work, it is a very efficient way to heat water. One of the biggest misconceptions about a heat pumps operation is what happens to the energy used to run the heat pump. For the most part, this energy does not go into the water. The electricity powering the unit operates the compressor and fan, along with the other controls and electronics. The electrical input energy if converted to btus only amounts to roughly 14,000btu. The bulk of the btu output comes from the heat energy extracted from the air. Thats why they operate so efficiently and the energy savings are so significant. And what does it mean to me, in simple terms? Stands for Co-efficient Of Performance. Its the way efficiency is measured for heat pump pool heaters. Believe it or not, its a very simple calculation. BTU Output ÷ BTU Input = C. See example of the C. Calculation for the Raypak model 5350ti. So based on the calculation above, a Raypak heat pump delivers efficiencies in excess of 600%! The highest efficiency a gas pool heater can obtain is 98%. The mystery is solved. This sounds too good to be true, prove it! We thought you would never ask! Raypak is a proud member of AHRI. Our heat pump pool heaters are third party tested and certified under the AHRI 1160 standard. All performance numbers are listed on the AHRI website directory. The units are tested at a high ambient temperature condition and a low ambient temperature condition. Furthermore, every Raypak unit meets or exceeds the Florida 4.0 minimum C. Requirement and is listed with the California Energy Commission. Unfortunately, not all manufacturers belong to AHRI and their published test data is questionable at best. When shopping for a pool heat pump, look for the AHRI Certified logo. This ensures that you are getting what you pay for, without the smoke and mirrors. Our units are also safety tested and certified by ETL, another third party testing agency. This ensures that all components and electrical design meet or exceed the UL-1995 stand. Old School or New School. We have you covered with the best of both worlds. Our digital control is easy to use, has a pool and spa temperature setting as well as full diagnostics. For those that prefer analog, Raypak offers our direct set thermostat. The easy-to-read, easy-to-use dials allow you to set your water temperature just the way you like it. Gone are the days of the guesswork involved with having to choose between the’blue & red swoosh’ like on your car’s A/Cnow you have the temperature targets displayed right on the dial! Spiral Rifled Titanium Heat Exchanger. And they said it couldn’t be doneTitanium has gained world recognition in just about every industry for its “nearly unbreakable” qualities. Additionally, due to Titanium’s rigidity, it has been nearly impossible to design an ultra-efficient heat exchanger using this metal. Raypak is the first company to offer the Spiral “Rifled” Titanium Tube heat exchanger. This proven technique drastically increases the surface area where super-heated gases can safely transfer heat to water. Rifling a Titanium Tube Heat Exchanger provides a truly efficient waterway that withstands the abuses of harsh pool chemistry and erosion. The spiral “rifled” exchanger also helps reduce deposit buildup, and increases efficiency by performing a scoop-and-lift action. While neither Titanium nor rifling is new to the heat pump industry, leave it to Raypak to bring the best of both worlds together to maximize your backyard investment! Raypak Heat-Cool units extend your swim season even longer! Just the right heat pump for climates that, in addition to having cooler-than-comfortable temperatures, can also have extremely hot summer months. With a Raypak Heat-Cool heat pump, your water temperature will always be comfortable. Just as households around the world have trusted us to heat their water during the colder monthsRaypak will also have you relaxing in your pool during the hot days of summer with cool, refreshing, chilled pool water. Having the ability to pull out the extra degrees Mother Nature put in will make your pool the envy of the neighborhood. No matter what time of year, a Raypak Heat-Cool will have you swimming when others wont venture outside. How Does it Work? Raypak Heat-Cool units have a unique reversing valve which enables the heat pump to not only take the chill out of the water, but also put it back in… Cooling your pool water during the hot summer months! Normally, a heat pump will gather heat energy from the air with its evaporator coil. Using Freon and several other components, the heat is transferred over to your pool water. By reversing this process the heat pump can actually take heat out of the water, transfer it to the Freon, and run it through the evaporator coil. The coil dissipates the heat into the air, much like a cars radiator. This is also the method of defrost for the heat-cool model. In cold ambient conditions, a heat pump will ice-up when the ambient air drops below 45 degrees. With a heatcool unit, the ice will melt off in a matter of minutes when in defrost mode. Standard heat pumps rely on the ambient air being drawn across the coil, which could take hours to defrost the coil, depending on the air temperature. Standard 95,000/92,000 BTU heater. Deluxe 117,000/113,000 BTU heater. Deluxe 133,000/125,000 BTU heater. Excellent choice for pool and spa applications in normal to humid climates. Tracking numbers will be emailed to you as soon as they are available. Any damages must be reported within 24 hours of receiving the product. Special Notes For International Orders. The item “Raypak Ruud 130K Btu Titanium Digital D8350ti-E Heat Pump” is in sale since Friday, February 26, 2016. This item is in the category “Home & Garden\Yard, Garden & Outdoor Living\Pools & Spas\Pool Equipment & Parts\Pool Heaters & Solar Panels”. The seller is “pool-and-spa” and is located in Berea, Ohio. This item can be shipped to United States. 014820 156 RUUD DIGITAL SWIMMING POOL 150K BTU NAT GAS HEATER 0-49. Product Condition: BRAND NEW. We do NOT accept local pickups. Please include a copy of the invoice with a written explanation of the reason for returning. If your product has a rebate listed, we will provide you with all information you may need to complete the rebate request. Some manufacturers require you to submit the rebate form digitally. The item “Raypak, Inc. 014820 156 RUUD DIGITAL SWIMMING POOL 150K BTU NAT GAS HEATER 0-49″ is in sale since Friday, October 5, 2018. This item is in the category “Home & Garden\Yard, Garden & Outdoor Living\Pools & Spas\Pool Equipment & Parts\Pool Heaters & Solar Panels”. The seller is “a1_superdeals” and is located in Las Vegas, Nevada. This item can be shipped to United States. Raypak Ruud M206A 206K BTU Pool and Spa Propane Gas Heater. Raypak Digital Propane Gas Heater. Raypak a Rheem Company. Model Number: M206A 206K BTU. The Raypak Digital gas heater comes with a microprocessor-based control center. This allows you to set your pool or spa temperature precisely at your preferred setting by simply pressing the up or down temperature control button. The digital display provides a constant readout of your pool or spa water temperature. Just set it, and forget it! If only your VCR were this easy to operate. Troubleshooting a Raypak gas heater has never been easier. The Raypak Digital has on-board diagnostic controls that let the user and the service professional know what is going on with the heater at all times. In the unlikely event that a problem develops the digital display easily points out the problem and the probable cause. It’s like having a service technician built into every heater! The new Raypak Digital is compatible with most major pool control and remote systems on the market today. Any two- or three-wire remote can connect to the Raypak Digital and be integrated into the pool control system of your choice. Burner design is a critical component in any gas heater. The stainless steel burner system used in the Raypak Digital is inherently forgiving and extremely robust. The burner is self-adjusting to compensate for gas pressure fluctuations, allowing the heater to always burn clean and safe. The soft-opening gas valve ensures smooth turn-on; no “Hard Light” to worry about. Easily removable burner tray and pilot assembly make service and maintenance a simple task. The Raypak Digital use a spark-to-pilot ignition system. This is the most reliable and robust ignition system available- an industry proven standard for over 20 years. The ceramic fiber combustion chamber keeps your heater running efficiently while ensuring the outside jacket stays cool. By using this space-age material, the heater won’t retain residual heat after it is turned off, allowing it to be installed without the need for excessive clearances. This heater is also certified for installation on a combustible surface. Performance and reliability are enhanced by the “pagoda top, ” designed to keep the Raypak Digital operating even in windy conditions. No need for fans to combat drafting problems. This heater is engineered to draft naturally in outdoor installations with its exclusive low-profile design. It is so thoughtfully and carefully constructed it actually protects itself from the things that tend to stifle ordinary pool and spa heaters. It delivers uninterrupted heating performance regardless of falling leaves, wind, airborne debris, rain, downdrafts, updrafts, sleet, snow, etc. PolyTuf Textured Powder Coating. The Raypak Digital has a polyester-coated, non-corrosive cabinet that is more durable than solventborne- and waterborne-coated metal cabinets. Every piece of sheet metal goes through a 7-stage wash system, making certain the powder paint has a perfect bond. Underneath the tough, yet beautiful finish you will find galvanized metal that offers superior rust prevention for years of durable service. Both water temperature and flow rate inside the heater are controlled to help eliminate condensation, sooting and scale build-up that can shorten the life of a heater. Raypak engineered the Unitherm Governor specifically for pool and spa heater applications, regulating low temperature incoming water to help reduce condensation. The Raypak Digital is equipped with polymer headers and an integral copper fin tube heat exchanger built with stainless steel tube sheets. This ensures rust-free performance, especially important when heating spas. Even the smallest details, such as the studs and nuts, are made out of stainless steel. A heater that will last year after year and can easily be serviced if the need should ever arise. The Raypak Digital is built to last with the highest quality integral copper fin tube available. Copper is well known for its ability to efficiently transfer heat, and is an excellent choice for pool and spa heater heat exchangers, where the water chemistry is properly maintained. Raypak heaters are available with an optional cupro-nickel fin tube heat exchanger for added protection against aggressive water chemistry, which has been known to attack copper heat exchangers and cause premature failure. Cupro-nickel’s major advantage over standard copper is that it’s more tolerant of bad water chemistry and is more resistant to erosion, thanks to a harder surface and a wall that is approximately 50% thicker. When you are unsure of your ability to maintain the pool or spa water chemistry, a cupro-nickel heat exchanger is a cost-effective way to protect against premature failure. Raypak offers an optional power vent feature. Sometimes, equipment rooms or unusual venting configurations require the use of a power vent. Being the heater experts, we have this option for you when the need may arise. The D-2 Power Vent assembly is a Category III mechanical draft venting system that operates under a positive static pressure that prevents excessive condensate production in the vent. All sizes are capable of relieving flue gases up to a maximum of 100 equivalent feet of vent length. All models have a standard 4 diameter exhaust connection. Using the Raypak-supplied adjustable 90° elbow, the flue gases may be discharged in any direction (see D-2 Power Vent manual for details). The D-2 Power Vent is also dual-voltage capable (120/240 volt) and engineered for long life and smooth operation. Amp Draw 120 volt. Amp Draw 240 volt. Designation for a Digital heater using propane gas is “EP”; a Digital heater using natural gas is “EN”. Designation for a Millivolt heater using propane gas is “MP”; a Millivolt heater using natural gas is “MN”. Prefix “P” is for plastic (polymer) headers. Suffix “X” is for cupro-nickel tubing; “C” is for copper tubing. Example: P-M406A-EN-X = Plastic headers, 406 model size, digital, natural gas, cupro-nickel. Reduce input 4% for each 1000 feet above sea level when installed above 2000 feet elevation. Technical Features – All Models. PolyTuf Textured Powder Coating : The Raypak gas heater has a polyester-coated, non-corrosive cabinet that is more durable than solventborne- and waterborne-coated metal cabinets. Underneath the tough, yet beautiful finish you will find galvanized metal that offers superior rust prevention and years of durable service. Wind-Resistant Design : No need for fans to combat drafting problems. This heater is designed to draft naturally in outdoor installations with its exclusive low-profile design. It is so thoughtfully and carefully designed it actually protects itself from the things that tend to stifle ordinary pool and spa heaters. Polymer Headers : Polymer headers prevent rust stains from harming your pool’s surface, giving you years of trouble-free swimming pleasure. All-Copper-Fin-Tube Heat Exchanger : The fin tubes of the heat exchanger are each made from a single piece of extruded copper. This integral-fin design allows maximum heat transfer to be attained and maintained. Cupro-nickel is also available as an optional upgrade. Stainless Steel Tube Sheet : Stainless steel tube sheets are used on all Raypak gas heaters. This allows for a completely nonferrous waterway, leaving your pool truly rust-free. CPVC 2″ Water Connections : Standard with every Raypak is a set of 2″ slip-fit CPVC water connections to make your installation secure and effortless. Condensation Protection : The Unitherm Governor helps reduce condensation from low inlet water temperatures. It automatically regulates the water flow to help keep the water temperature in the heat exchanger above 105°F. Both water temperature and water flow rate are controlled to eliminate condensation, sooting, and scale build-up that can shorten heater life. High Flow Rates : The Raypak gas heater comes with an automatic bypass built into the header. Burner Tray : Every burner tray is built to last, from the stainless steel burners to the aluminized metal used in the heat sensitive areas. Innovative design allows for the easy removal of the tray and burners for servicing. Fire Tile : A ceramic fiber combustion box keeps your heater running efficiently while keeping the outside jacket cool. By using this space-age material the heater won’t retain residual heat after it is turned off, allowing it to be installed without the use of costly metal heat sinks. Fuel-Efficient : Energy-smart Raypak heaters consistently achieve the highest efficiency ratings. They exceed all federal and state standards. Technical Features – Digital Models Only. Microprocessor-Controlled Thermostat : The Raypak Digital gas heater features a microprocessor-based control center. This control allows you to set your pool or spa temperature precisely at your favorite setting just by pressing the up or down temperature control buttons. Self-Diagnostic : On-board diagnostic controls let the user and the service professional know what is going on with the heater at all times. In the event that you would ever have a problem with the heater, the digital display will indicate the source. Remote-Compatible : Compatible with most major pool control and remote systems on the market today. Any two-wire or three-wire remote can connect to the heater and be integrated into the pool control system of your choice. Electronic Ignition : Raypak Digital heaters come standard with intermittent spark ignition pilot safety controls. What this means is that the pilot only comes on when there is a call for heat. This provides an energy-efficient way to control your heater’s gas usage by eliminating the need for a continuous pilot. ISO 9001 : We are proud to be an ISO 9001 registered manufacturing plant. It’s one more reason why Raypak is number one in the heater industry today. End-of-Line Test : Every Raypak gas pool heater is plumbed and test-fired before it is put in the carton. This ensures that your heater will work right out of the box and continue to give you years of trouble-free operation. Quality Check Points : The Raypak assembly process includes six final assembly quality check points that help to ensure that every Raypak gas heater is built correctly, and built to last. CSA-Certified : All of Raypak’s gas pool heaters are CSA-certified and are tested by CSA to the ANSI Z21.56 standard. Tracking numbers will be emailed to you as soon as they are available. Any damages must be reported within 24 hours of receiving the product. Special Notes For International Orders. The item “Raypak Ruud M206A 199K BTU Pool and Spa Propane Gas Heater” is in sale since Friday, February 26, 2016. This item is in the category “Home & Garden\Yard, Garden & Outdoor Living\Pools & Spas\Pool Equipment & Parts\Pool Heaters & Solar Panels”. The seller is “pool-and-spa” and is located in Berea, Ohio. This item can be shipped to United States. 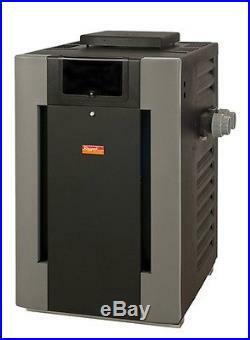 RayPak Ruud Compact M2350Ti-E 50k Btu Pool Heat Pump. Take a really close look at the Rheem Com-pact Series and you will truly see that there is no comparison. The Raypak Compact Series heat pump pool heater is the perfect solution for above ground pools and smaller in-ground pools. The same components that are used in all of our larger heat pumps are used in the Compact Series. Rheem has not cut any corners or sacrificed performance in this smaller collection of high performance heatpumps. Exclusive DuraSteel Powder-Coated Cabinet Polyester powder-coated, non-corrosive cabinet is more durable than plastic heat pump cabinets. Same rugged steel construction used by all the major air conditioner manufacturers. Large Air Coils Raised lanced-fin design maximizes heating at lower temperatures. Raypak engineered coils are highly optimized to meet our specific design requirements. From the proper fins per inch to advanced distribution circuiting. We are the only heat pump pool heater company to actually manufacture our own coils. Venturi Fan Cowling High-capacity 3000-cfm fan provides unrestricted air flow for better heating. Precision engineered and manufactured cabinet design eliminates unwanted air gaps. This means more air over the coil which translates to greater efficiency. Scroll Compressor Scroll compressors are quiet and efficient compared to piston-type compressors. They provide higher efficiency, lower sound levels, superior durability and unsurpassed reliability. The unique design of a scroll compressor actually wears. Sound Isolation Pads Prevents sound transfer to equipment pad and elevates the base pan to improve water drainage. Its the little details like this that make Raypak products stand out from the crowd. Spiral Titanium Tube Our spiral titanium-tube heat exchanger provides a corrosion-free waterway that can withstand the abuses of harsh pool chemistry. The spiral tube helps reduce deposit build-up and increases efficiency by performing a scoop-and-lift action. Plumbing Connections Offset 1½ PVC union connections are included for ease of installation. Pool/Spa Control Your digital heat pump pool heater can be set to have a different target temperatures for your pool and your spa. This allows you to dial in just the right spa temperature and never have to adjust it again. The pool can be set to a lower, more energy saving temperature. Remote Compatible The digital heat pump pool heater can be easily controlled by most two-wire and three-wire remote systems. On Board Diagnostics Tells the homeowner if there is a problem. Provides the service technician with detailed diagnostic information. Tracking numbers will be emailed to you as soon as they are available. Any damages must be reported within 24 hours of receiving the product. Special Notes For International Orders. The item “RayPak Ruud Compact M2350Ti-E 50k Btu Pool Heat Pump” is in sale since Friday, February 26, 2016. This item is in the category “Home & Garden\Yard, Garden & Outdoor Living\Pools & Spas\Pool Equipment & Parts\Pool Heaters & Solar Panels”. The seller is “pool-and-spa” and is located in Berea, Ohio. This item can be shipped to United States. Raypak Ruud M406A 399k BTU Cupro Nickel Pool and Spa Propane Gas Heater D406A-E. Raypak Digital Propane Gas Heater with Cupro Nickel. Raypak a Rheem Company. The Raypak Digital gas heater comes with a microprocessor-based control center. This allows you to set your pool or spa temperature precisely at your preferred setting by simply pressing the up or down temperature control button. The digital display provides a constant readout of your pool or spa water temperature. Just set it, and forget it! If only your VCR were this easy to operate. Troubleshooting a Raypak gas heater has never been easier. The Raypak Digital has on-board diagnostic controls that let the user and the service professional know what is going on with the heater at all times. In the unlikely event that a problem develops the digital display easily points out the problem and the probable cause. It’s like having a service technician built into every heater! The new Raypak Digital is compatible with most major pool control and remote systems on the market today. Any two- or three-wire remote can connect to the Raypak Digital and be integrated into the pool control system of your choice. Burner design is a critical component in any gas heater. The stainless steel burner system used in the Raypak Digital is inherently forgiving and extremely robust. The burner is self-adjusting to compensate for gas pressure fluctuations, allowing the heater to always burn clean and safe. The soft-opening gas valve ensures smooth turn-on; no “Hard Light” to worry about. Easily removable burner tray and pilot assembly make service and maintenance a simple task. The Raypak Digital use a spark-to-pilot ignition system. This is the most reliable and robust ignition system available- an industry proven standard for over 20 years. The ceramic fiber combustion chamber keeps your heater running efficiently while ensuring the outside jacket stays cool. By using this space-age material, the heater won’t retain residual heat after it is turned off, allowing it to be installed without the need for excessive clearances. This heater is also certified for installation on a combustible surface. Performance and reliability are enhanced by the “pagoda top, ” designed to keep the Raypak Digital operating even in windy conditions. No need for fans to combat drafting problems. This heater is engineered to draft naturally in outdoor installations with its exclusive low-profile design. It is so thoughtfully and carefully constructed it actually protects itself from the things that tend to stifle ordinary pool and spa heaters. It delivers uninterrupted heating performance regardless of falling leaves, wind, airborne debris, rain, downdrafts, updrafts, sleet, snow, etc. PolyTuf Textured Powder Coating. The Raypak Digital has a polyester-coated, non-corrosive cabinet that is more durable than solventborne- and waterborne-coated metal cabinets. Every piece of sheet metal goes through a 7-stage wash system, making certain the powder paint has a perfect bond. Underneath the tough, yet beautiful finish you will find galvanized metal that offers superior rust prevention for years of durable service. Both water temperature and flow rate inside the heater are controlled to help eliminate condensation, sooting and scale build-up that can shorten the life of a heater. Raypak engineered the Unitherm Governor specifically for pool and spa heater applications, regulating low temperature incoming water to help reduce condensation. The Raypak Digital is equipped with polymer headers and an integral copper fin tube heat exchanger built with stainless steel tube sheets. This ensures rust-free performance, especially important when heating spas. Even the smallest details, such as the studs and nuts, are made out of stainless steel. A heater that will last year after year and can easily be serviced if the need should ever arise. The Raypak Digital is built to last with the highest quality integral copper fin tube available. Copper is well known for its ability to efficiently transfer heat, and is an excellent choice for pool and spa heater heat exchangers, where the water chemistry is properly maintained. Raypak heaters are available with an optional cupro-nickel fin tube heat exchanger for added protection against aggressive water chemistry, which has been known to attack copper heat exchangers and cause premature failure. Cupro-nickel’s major advantage over standard copper is that it’s more tolerant of bad water chemistry and is more resistant to erosion, thanks to a harder surface and a wall that is approximately 50% thicker. When you are unsure of your ability to maintain the pool or spa water chemistry, a cupro-nickel heat exchanger is a cost-effective way to protect against premature failure. Raypak offers an optional power vent feature. Sometimes, equipment rooms or unusual venting configurations require the use of a power vent. Being the heater experts, we have this option for you when the need may arise. The D-2 Power Vent assembly is a Category III mechanical draft venting system that operates under a positive static pressure that prevents excessive condensate production in the vent. All sizes are capable of relieving flue gases up to a maximum of 100 equivalent feet of vent length. All models have a standard 4 diameter exhaust connection. Using the Raypak-supplied adjustable 90° elbow, the flue gases may be discharged in any direction (see D-2 Power Vent manual for details). The D-2 Power Vent is also dual-voltage capable (120/240 volt) and engineered for long life and smooth operation. Amp Draw 120 volt. Amp Draw 240 volt. Designation for a Digital heater using propane gas is “EP”; a Digital heater using natural gas is “EN”. Designation for a Millivolt heater using propane gas is “MP”; a Millivolt heater using natural gas is “MN”. Prefix “P” is for plastic (polymer) headers. Suffix “X” is for cupro-nickel tubing; “C” is for copper tubing. Example: P-M406A-EN-X = Plastic headers, 406 model size, digital, natural gas, cupro-nickel. Reduce input 4% for each 1000 feet above sea level when installed above 2000 feet elevation. Technical Features – All Models. PolyTuf Textured Powder Coating : The Raypak gas heater has a polyester-coated, non-corrosive cabinet that is more durable than solventborne- and waterborne-coated metal cabinets. Underneath the tough, yet beautiful finish you will find galvanized metal that offers superior rust prevention and years of durable service. Wind-Resistant Design : No need for fans to combat drafting problems. This heater is designed to draft naturally in outdoor installations with its exclusive low-profile design. It is so thoughtfully and carefully designed it actually protects itself from the things that tend to stifle ordinary pool and spa heaters. Polymer Headers : Polymer headers prevent rust stains from harming your pool’s surface, giving you years of trouble-free swimming pleasure. All-Copper-Fin-Tube Heat Exchanger : The fin tubes of the heat exchanger are each made from a single piece of extruded copper. This integral-fin design allows maximum heat transfer to be attained and maintained. Cupro-nickel is also available as an optional upgrade. Stainless Steel Tube Sheet : Stainless steel tube sheets are used on all Raypak gas heaters. This allows for a completely nonferrous waterway, leaving your pool truly rust-free. CPVC 2″ Water Connections : Standard with every Raypak is a set of 2″ slip-fit CPVC water connections to make your installation secure and effortless. Condensation Protection : The Unitherm Governor helps reduce condensation from low inlet water temperatures. It automatically regulates the water flow to help keep the water temperature in the heat exchanger above 105°F. Both water temperature and water flow rate are controlled to eliminate condensation, sooting, and scale build-up that can shorten heater life. High Flow Rates : The Raypak gas heater comes with an automatic bypass built into the header. Burner Tray : Every burner tray is built to last, from the stainless steel burners to the aluminized metal used in the heat sensitive areas. Innovative design allows for the easy removal of the tray and burners for servicing. Fire Tile : A ceramic fiber combustion box keeps your heater running efficiently while keeping the outside jacket cool. By using this space-age material the heater won’t retain residual heat after it is turned off, allowing it to be installed without the use of costly metal heat sinks. Fuel-Efficient : Energy-smart Raypak heaters consistently achieve the highest efficiency ratings. They exceed all federal and state standards. Technical Features – Digital Models Only. Microprocessor-Controlled Thermostat : The Raypak Digital gas heater features a microprocessor-based control center. This control allows you to set your pool or spa temperature precisely at your favorite setting just by pressing the up or down temperature control buttons. Self-Diagnostic : On-board diagnostic controls let the user and the service professional know what is going on with the heater at all times. In the event that you would ever have a problem with the heater, the digital display will indicate the source. Remote-Compatible : Compatible with most major pool control and remote systems on the market today. Any two-wire or three-wire remote can connect to the heater and be integrated into the pool control system of your choice. Electronic Ignition : Raypak Digital heaters come standard with intermittent spark ignition pilot safety controls. What this means is that the pilot only comes on when there is a call for heat. This provides an energy-efficient way to control your heater’s gas usage by eliminating the need for a continuous pilot. ISO 9001 : We are proud to be an ISO 9001 registered manufacturing plant. It’s one more reason why Raypak is number one in the heater industry today. End-of-Line Test : Every Raypak gas pool heater is plumbed and test-fired before it is put in the carton. This ensures that your heater will work right out of the box and continue to give you years of trouble-free operation. Quality Check Points : The Raypak assembly process includes six final assembly quality check points that help to ensure that every Raypak gas heater is built correctly, and built to last. CSA-Certified : All of Raypak’s gas pool heaters are CSA-certified and are tested by CSA to the ANSI Z21.56 standard. Tracking numbers will be emailed to you as soon as they are available. Any damages must be reported within 24 hours of receiving the product. Special Notes For International Orders. The item “Raypak Ruud M406A 399k BTU Cupro Nickel Pool and Spa Propane Gas Heater D406A-E” is in sale since Friday, February 26, 2016. This item is in the category “Home & Garden\Yard, Garden & Outdoor Living\Pools & Spas\Pool Equipment & Parts\Pool Heaters & Solar Panels”. The seller is “pool-and-spa” and is located in Berea, Ohio. This item can be shipped to United States.